Flowering plants that bloom continuously have always fascinated me. I often wondered what the secret was to soil fertilizers for this to happen. In my curiosity with fertilizers, I discovered that there's a category of fertilizers that may also be sprayed directly to the leaves or foliage. These are foliar fertilizers. But for you to apply these, you need a sprayer. And the only sprayers I had are the cheap squirt plastic bottles. I used one to spray the foliar fertilizer and realized quickly just how difficult it was to apply fertilizer with it. That's until I found and bought one of these. The photo below shows a garden sprayer applying foliar fertilizer in fine mist. Squirt plastic spray bottles are adequate for applying foliar fertilizers in very small amounts. But if you have many plants to spray, then it becomes a problem. Constantly squeezing on the pump trigger of the squirt sprayer is hard on the fingers. This is especially so if you need to spray fertilizer for an extended time. 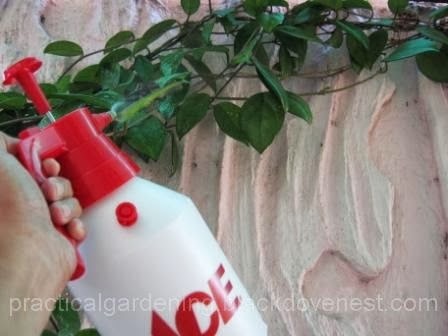 You would need to frequently rest your arm if you have to spray garden plants for even just half an hour. Many squirt sprayers bottles are small. The container may not be big enough to completely spray plants in the garden. That translates to frequent replenishment of foliar fertilizer in the container. That is potential wastage of fertilizer due to spills when refilling the container. The garden sprayer shown above is a compression sprayer. Compression sprayers are the most common type of spray equipment. After adding a chemical solution (fertilizer or pesticide), the remaining air inside is pressurized. This is achieved by pumping the handle a designated number of times. Pumping the handle around 25 to 30 times is enough to build pressure in the garden sprayer's 1.5 liter tank. Depending on the spray performed, you may need to re-pump the handle. A coarse jet stream will undoubtedly release more pressure than a fine mist and re-pumping the handle is required for continued spraying. The nozzle is adjustable for spray pattern and amount. Turn the nozzle clockwise for a fine mist and counter-clockwise for a concentrated stream. The photo below shows spraying with a precise non-drift spray targeted near the roots of a Hoya vine. You can start and stop the spray quickly and at will. Just press the button with the thumb to spray and release the button to stop. The button also has a lock tab for continuous spraying. Pushing this tab with the thumb allows uninterrupted spraying. Pulling it, releases the lock and returns to the start-stop mode of spraying. If there is excess air pressure and spraying is finished, you can pull on the pressure release valve at the side of the plastic tank. This action discharges residual air pressure inside the plastic tank. Storing the garden sprayer without the residual air pressure extends the life of the garden sprayer. Spray up or down, especially underneath leaves. Mix chemicals with water thoroughly, as there may be danger to clog the nozzle. Do not spray on a windy day. Winds may blow spray material off target. Wear protective clothing, including gloves, mask or goggles, as needed.